Ian Why is a hero…. 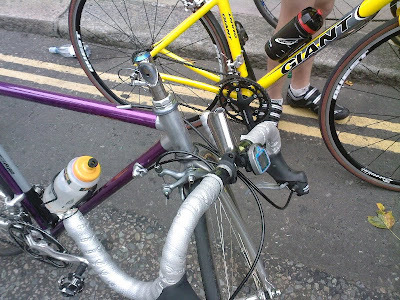 On yesterday’s Sky Ride the stem on Vyv’s bike sheared as she was approaching St Paul’s Cathedral. As she was practicing her slow speed bike handling skills (she does this a lot! ), the plunge earthwards was at a sedate pace. Fist bit of luck was that we agreed to lunch at “Look Mum no Hands“, just a short walk from St Pauls. Second bit of luck…..”LMNH” were holding a sale of scrap iron, which some cyclists see as jewels of bedazzling beauty. For £3, a dusty pair of bars and a quill stem were bought. Next followed a blur of a Allen keys, punctuated with hammer blows as Ian Why set about replacing the bars and stem. What a fine job he did too, even replacing the bar tape!! Having also bust her sturdy tourer the previous weekend Vyv is now considering opening a cafe called “Look Mun No Handle bars“. Ian, thank you once again for saving the day and thank you also to the helpful mechanic at “LMNH” who kindly let us her tools. Aaaagh! Glad nobody was hurt – I'm paranoid about metal fatigue, me.